We provide exceptional DJ services for every occasion, wedding receptions, bars, parties, karaoke, school dances. We don't offer package deals like all the other DJ companies, with us you get the best all the time! We will play music during cocktails and dinner of our choosing. We are more than willing to accommodate your needs: Grand March, announcements, Slide Show, music and more. We always include the best lighting effects, great sound equipment designed to fit the needs of the venue, fog machine and lasers. We have wireless microphones for speeches and all at no additional cost to you. We provide MC/DJ services for fundraisers, corporate events and parties. We will also include wireless microphones and lighting if needed at no additional charge. We have a great selection of Karaoke music for your next event, with over 30,000 songs we are sure to have the right song for you. Contact us for more information. Photo booths are a great way to capture all of those moments at any event and your guests get to take a memento home with them as well. We can't wait to help you with your next event. We provide great up-lighting to make your reception or party POP! We can match your colors!!! 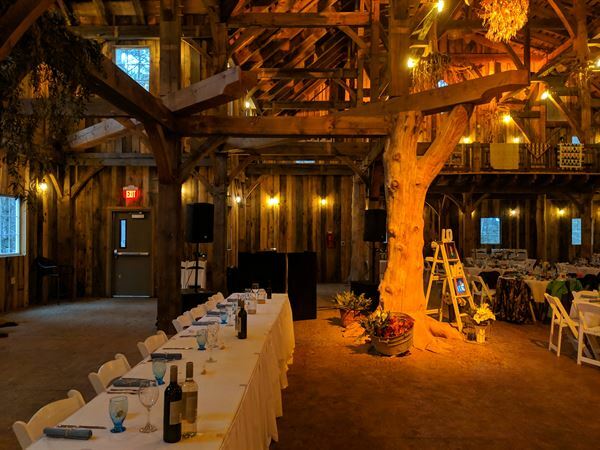 Special Features: We are different than the "other guys" we don't have package deals, we think that you should get everything you need for your wedding reception or event at no additional cost to you. Lighting, fog machine, wireless mics, announcements and great music!! !